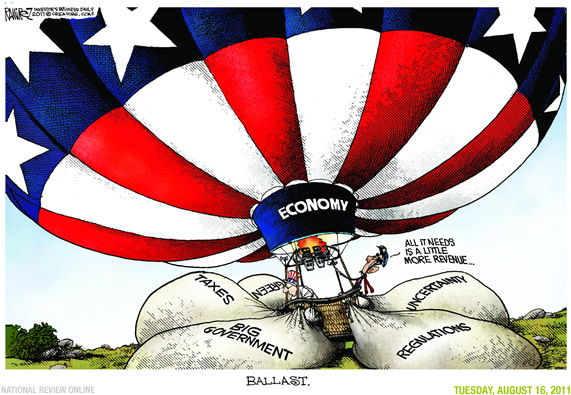 I could write a lengthy post about why Obamanomics has been a failure, but this cartoon says it perfectly. It has the same basic message as this classic cartoon – people are less likely to produce when government is too much of a burden. If you want some empirical evidence about the impact of Obama’s statism, check out this picture of how much money companies are keeping on the sidelines and this one about loanable funds that banks have deposited at the Fed. Both are compelling signs that investors and entrepreneurs don’t trust the nonsense coming from Washington. Supply and demand are organic; from the natural needs of the people. Govt pumping up demand is artificial. If it worked, it would only last as long as the artificial ‘fuel’ continues to flow. Stop the artificial demand, adios demand. To imply otherwise assumes there is demand already among the people but we are sitting on it waiting for something to prime our pump. If we are sitting on our demand, we’re waiting for something real in the economy not more govt debt. You can’t spend your way out of debt. Try it on your family and see how it works. It’s about trying to do something to pump up Demand. Since he couldn’t get the $1.2 Trillion most people were saying it would take, Obama settled for an effort aimed at just stopping the hemorrhaging and buying some time. Unfortunately, nobody’s gotten around to addressing the problems – things like Equity Stripping, Capital Exportation, Labor Arbitrage, Fair Trade, etc. The rest of it – the kind of crapola depicted in this cartoon – is the stuff of bumper stickers and campaign buttons, intended to occupy and amuse the smaller minds. You’re being distracted by the spectacle of the games in order to make you less likely to notice how badly you’re bleeding. This is the last revenue increase we’lll ask for. We promise! We’re just a mere 2% of GDP from satisfaction. We promise! “All it needs is a little more revenue”.. same story, different covers in different parts of the world..